It's been a hectic few weeks. On November 27th, RRR and Nui left Yuma to head to their respective homes for Christmas. Nui headed to Vancouver, where the temps dropped to -6C, which cemented her resolve to head back to Yuma and stay put for the rest of the winter. RRR, on the other hand, was heading for -45C temps, but, being a hardy soul, decided to stay in Sudbury. Nui is hoping to persuade her to re-think that plan for next year. RRR still hasn't had a chance to wear her "blingy" t-shirts because "it's been too cold". Anyone who knows her will instantly know that the end of the world is upon us. RRR has been known to go outside in the dead of a Northern Ontario winter, wearing only a tank top and thin cotton pants under a light jacket. Nui is planning to build an ark, in preparation for the coming apocalypse. Nui was delighted to welcome Prince Porketta's wife and daughter for two weeks in early December. There was sadness as we reminisced about all the good times with the Prince, but there was also lots of fun. There were marathon shopping sprees (Nui gave up after the second one) and lots of boots were bought, including one pair of thigh-high leather boots with 6 inch heels! How anyone can walk in those things is anyone's guess. No wonder we all have bad backs when we get into middle age. The holidays were fun and busy as usual. It was so much fun to have a little kid around. My great-niece Willow was hard to pin down for photos - she is in constant motion. We should rename her Whirlwind Willow. 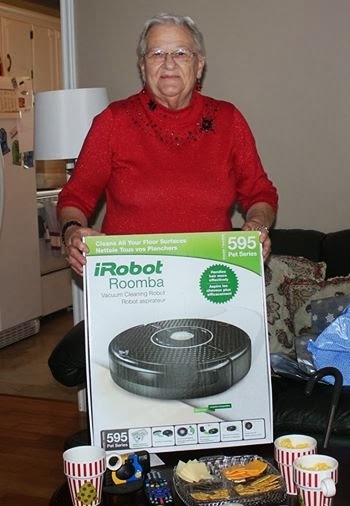 We're happy to report that Santa was very good to RRR and he gave her an iRobot vacuum cleaner. She plans to name it Agador, in honor of Nui's faithful floor cleaner (which she couldn't live without). What both Nui and RRR needed, though, were new decks of cards. Over the 2 months that they were together, they played roughly 1000 card games (specifically, "that f***ing game") and wore out 2 decks of cards. These have been preserved for posterity. It will be lonely here without RRR - she was a great travelling companion. With any luck (and if the insurance companies would quit being so greedy), she will come back and the adventures will resume.